Ethereum has lost 2.6% on a daily basis. Business Insider reports CBOE plans to launch ETH futures. ETH/USD dropped to $270 late on Thursday amid global sell-off on cryptocurrency markets. The second largest coin has recovered to $279 by press time, having lost 1.7% since the beginning of Friday and 2.6% on a daily basis. ETH’s market cap is registered at $28.5B, while the average daily trading volume reached $1.5B, somewhat higher from Thursday’s level. CBOE Global Markets is reportedly planning to launch ETH futures by the end of 2018, according to Business Insider. The operator is now waiting for the approval from Commodities Futures Trading Commission (CFTC). CBOE launched BTC futures in December 2017, using the quotes from New York-based crypto exchange Gemini as an underlying market. CBOE Global Markets president Chris Concannon hinted that Ethereum futures might have been coming back in June when Securities and Exchange Commission said that Ethereum was not a security. “This announcement clears a key stumbling block for Ether futures, the case for which we’ve been considering since we launched the first Bitcoin futures in December 2017,” he commented. 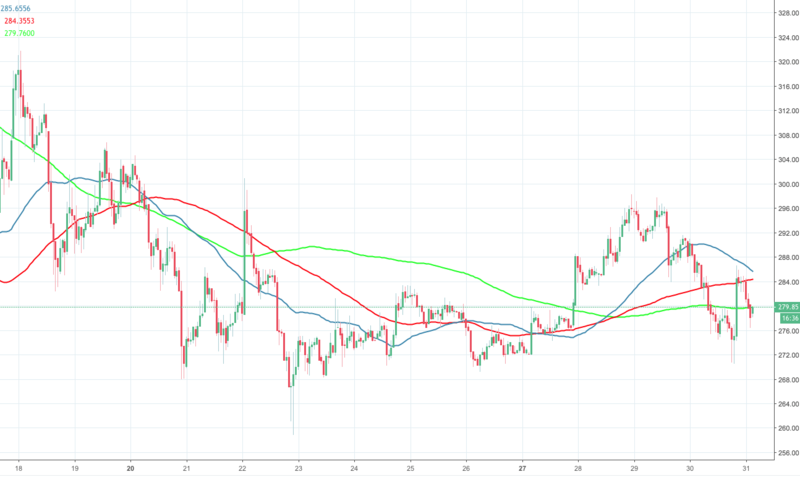 ETH/USD dropped below SMA50, SMA100 and SMA200 on 1-hour chart, which makes the short-term picture rather gloomy. The first line of resistance comes at $280, though the coin needs to regain $290 strengthened by 38.2% Fibo retracement (daily) before it gets the chance to retest $300. On the downside, the support is created by Thursday’s low at $270, followed by $258 (August 22 low).